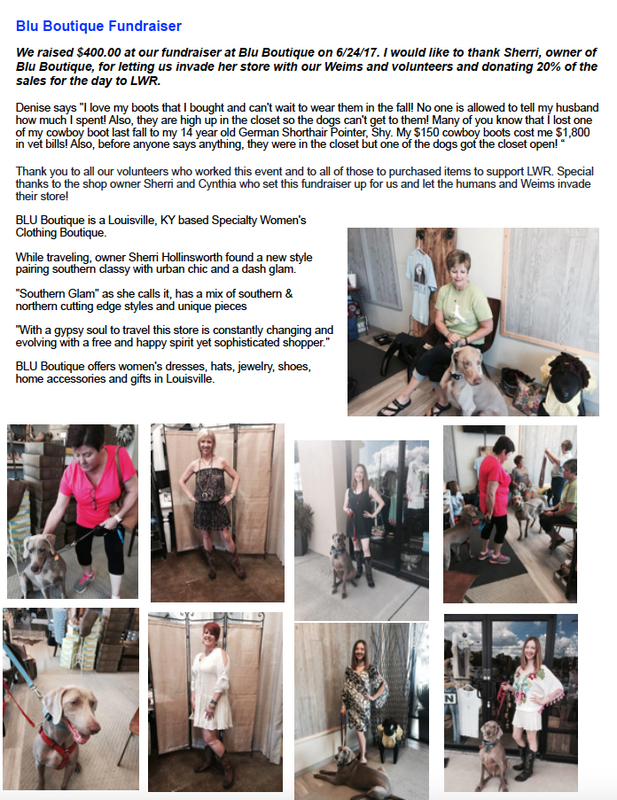 SPECIAL NEEDS | Louisville Weimaraner Rescue Inc. 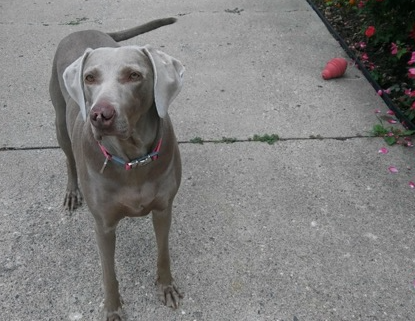 In the past year, we have taken in and placed more special needs Weims than in previous years. 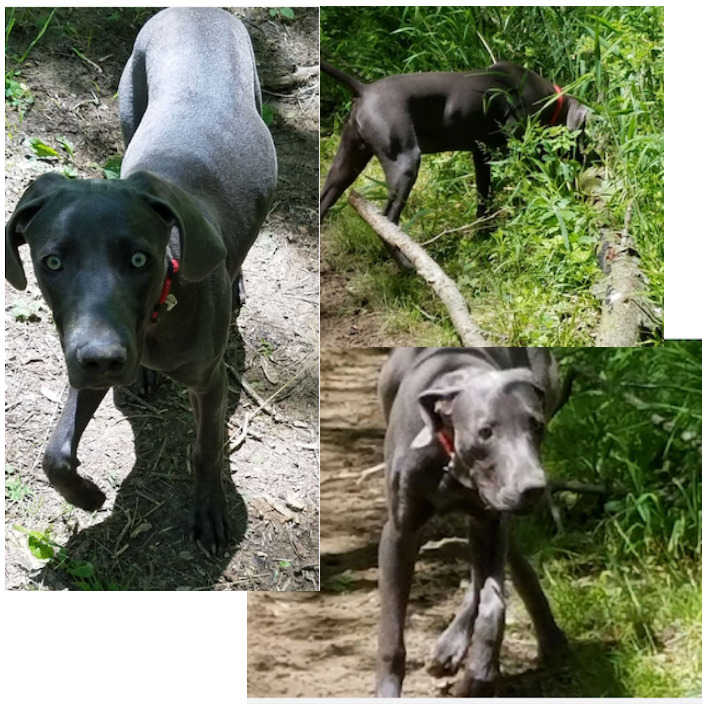 This past summer alone we had 4 Weims come in that were heartworm positive and needed extensive treatment. Each heartworm case can cost up to $1,000 to treat, not including any complications that may arise. 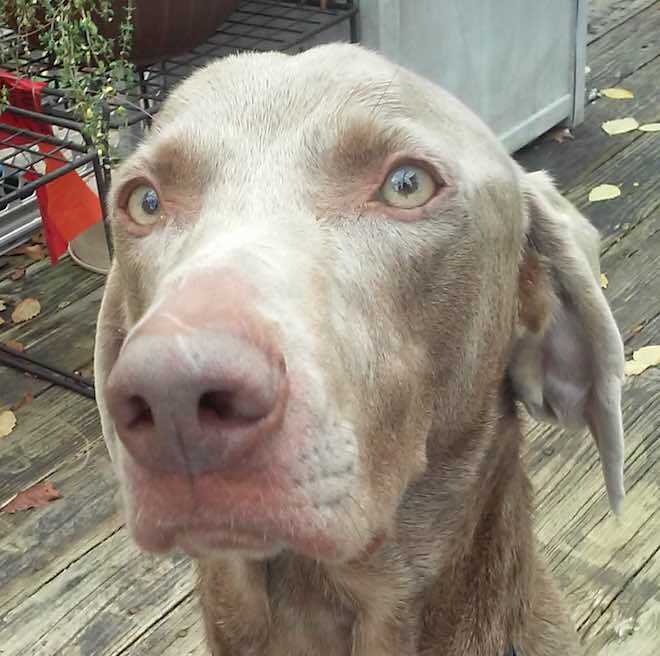 All the heartworm positive Weims have recovered and gone on to be adopted by loving homes. Pictured here are Harley, Johnny, Lulu, Sadie (1), Sadie (2) and Winston. These are just six of the special needs cases we have taken in this year. All have recovered and gone to their forever homes except for Winston. He just came to us in October and will be with us for a while. Winston is 3 years old, and has renal disease. We are still in the process of determining the type of renal disease he has and the proper treatment for it. 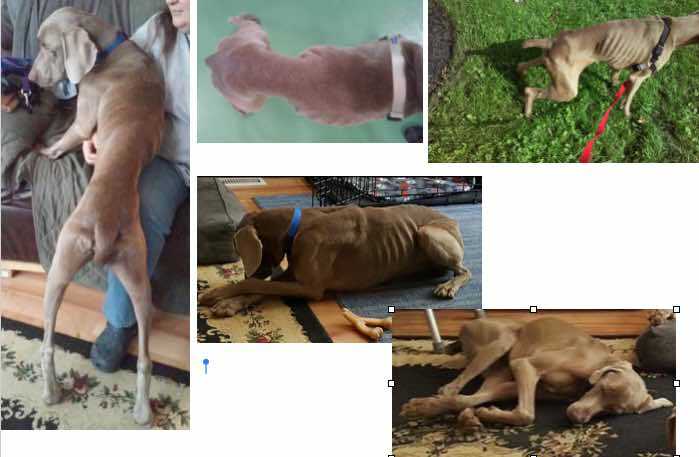 Since coming into rescue in mid October 2017, LWR has incurred approximately $2,700 in vet bills for Winston, and we have more bills yet to come. His monthly food and medicine alone is over $300. This is Winston’s story. Winston was first purchased from a breeder in California and shipped across the country to Indiana. This owner had health issues, and kept Winston crated and hidden from his family for about a year. When the owner’s family found out about Winston, they re-homed him because they knew Winston was not being properly cared for. 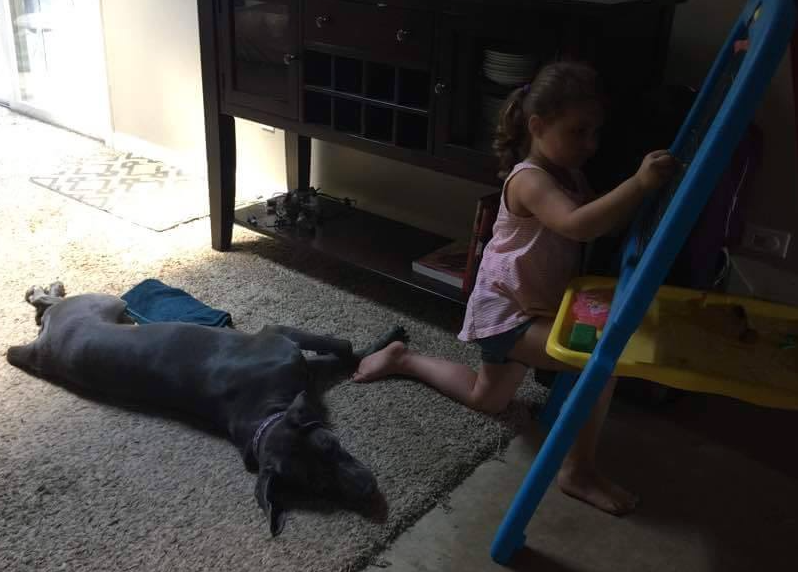 At his next home, Winston lived with a family who had another dog and a young human. All was well for about 1 1/2 years. The family moved to a farm where the house was too small for the two dogs, so the dogs were kept outside in a 10′ x 35′ kennel. Winston would get bored and escape the kennel. 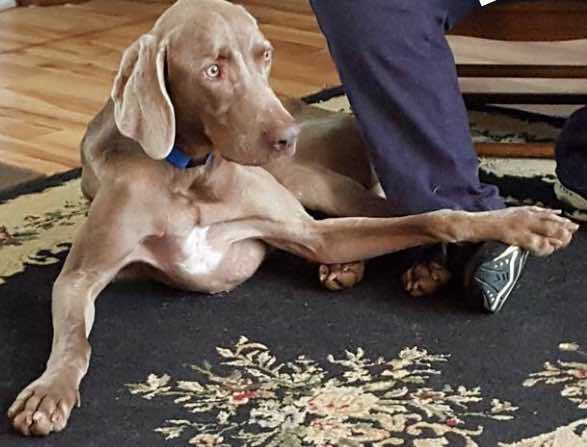 The first time he escaped in November 2016, Winston was hit by a car and broke all the phalanges on his rear left foot. About this time, Winston was diagnosed with renal disease, put on medication, and had to eat a special prescription food. Since Winston continued to get out of the kennel and chase livestock, his family decided it was best for him to be re-homed. 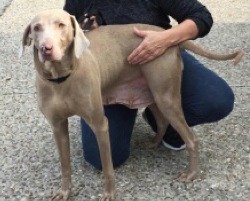 Winston is now safe and being cared for by Louisville Weimaraner Rescue, Inc. We are committed to fully diagnosing and treating Winston’s kidney disease, which is the reason he is so thin. Please help sponsor Winston by donating toward his vet bills. Be sure to mention Winston in the comments when donating. Harley is under one year old and had a severe case of Parvo which cost over $4,000 to treat. She has since recovered and is living happily with her new family. 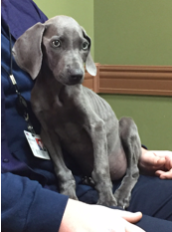 Johnny is a 4-month-old, 9.5# puppy who came to us in December 2016 diagnosed with Juvenile Onset Diabetes Mellitus. He is now a happy puppy and has been adopted by his foster home. Over the course of the next 2.5 months, Johnny was closely monitored by his foster mom and internist. Many blood glucose curves were done and insulin levels adjusted. He had various blood tests and ultra sounds done. His foster mom worked hard on getting him potty trained as the effects of uncontrolled diabetes dwindled with care and treatment. As of the middle of February, Johnny had more than doubled in weight. Johnny’s diabetes is under control. 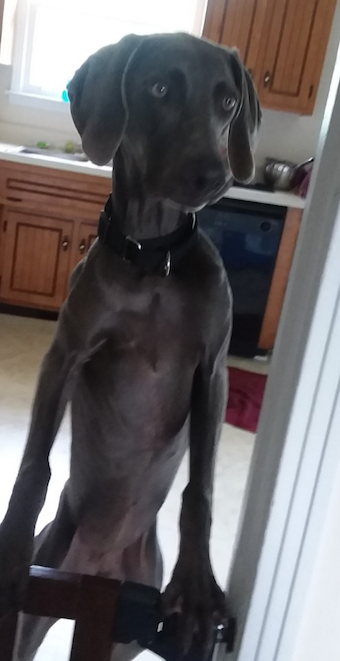 He weighs 45# now (May 2017), andand actually looks like a real dog! He continues to grow every day. His foster/adoptive mom calls him a sour patch kid. He can be real sweet one minute, and then in the blink of an eye, be just as rotten. Lol! But I guess he has 3 months of puppiness to make up for. We are so glad to hear Johnny is living a good life now!. Lulu is 3-5 years old, and another victim of repeated breeding and irresponsible care. She was found in southern KY running loose, scared, and confused in traffic. 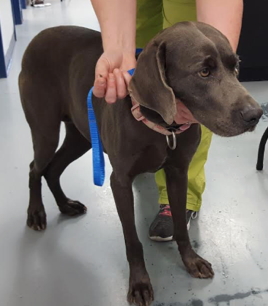 Sadly, Lulu is also heartworm positive along with having conjunctivitis, bacterial and fungal infections in her ears, a respiratory infection, and a possible genetic malformation of her snout. Lulu was very stressed for awhile before settling in at her foster home in MI. When Lulu’s foster mom, Robin, saw Lulu on our Facebook page, something clicked, and she drove 350 miles to pick Lulu up and 350 miles back home. 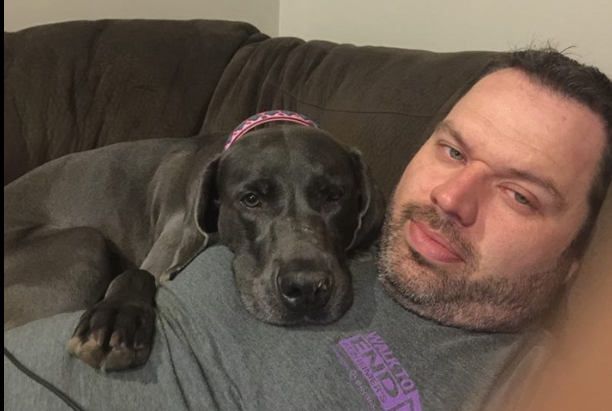 Lulu is loving her new human foster family, Weim brother and cat sister – she may even stay there for the rest of her life after she is heartworm-free, spayed, and healthy! As of mid May 2017, Lulu has had multiple chest xrays and vet exams to monitor her heartworm condition. One of the xrays showed a BB lodged in her body. She is gaining weight and getting stronger, though she will have to be on steroids for a long time to help keep the inflammation down in her lungs. Lulu has not been spayed yet as it would not be safe for her to go under anesthetic. Once she is healthy enough, she will be spayed and the BB removed. She will have a heartworm test again in August. Her exercise and activity is still restricted. July 1, 2017 Here is a picture of Lulu going on her first walk after testing negative for heartworms! It has been a long road for her with many complications since we rescued her at the beginning of February. Lulu with her blue foster brother Hubble! At the end of July, she will be spayed and have the lodged BB removed, then she will be officially adopted by her foster home! Lulu’s vet bills are close to $4,000 and more are still coming in. Sadie (1) is a 5-year-old from a shelter in TN. Sadie lived with a known hoarder/breeder until Sadie could not produce puppies anymore, then she was tossed to the shelter like many before her. Sadie tested positive for heartworms and should not have undergone anesthesia for spaying, but she had a bad case of pyometria (infection of the uterus), and had to undergo life-saving surgery right away. Sadie was on antibiotics to ward off infection from the surgery, and she will hopefully be ready for adoption mid summer. As of May 2017, Sadie was still fighting dry eye and an ear infection. She was on prednisolone for the heartworms every day until the end of June. 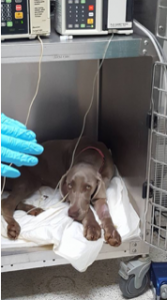 She received the first immiticide injection at the end of April and thel last 2 immiticide injections the beginning of June to kill off the heartworms. Sadie’s vet bills have totaled over $1,500. Her exercise and activity was restricted until the end of June. Thanks so much to her foster mom, Michele, for seeing her through 4 months of treatment and restricted activity, yet keeping up with her training. Sadie was adopted at the end of July! She shares her new home with a fur sibling and a couple human siblings. Do you think she is comfortable in her new home? Sadie (2), is a lovely blue year-old female who appeared to be in peak health when we brought her into rescue in June 2017. Her owner did not want to take care of her anymore so a good samaritan took her in. 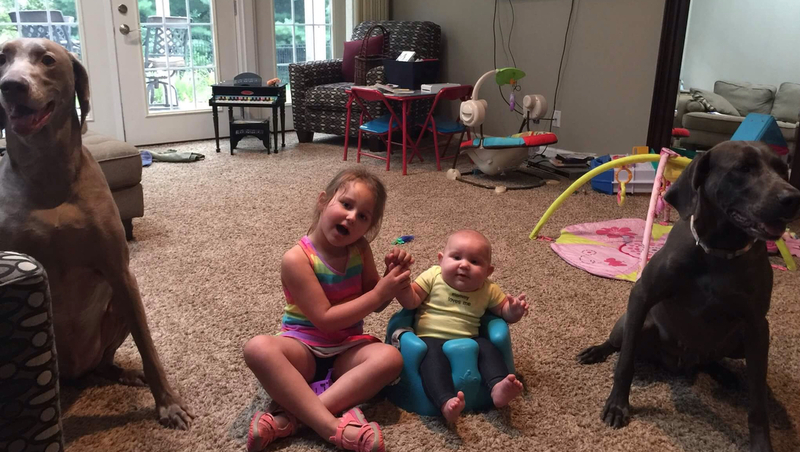 The high energy of a young weim combined with very young kids and a senior small dog was more than she could handle at the time. She made the difficult decision to do what was best for Sadie and called our rescue. We are thankful she did because when she went to the vet for a heartworm test they discovered what seemed to be a serious genetic heart efect. They recommended she see a cardiologist for a full work-up. 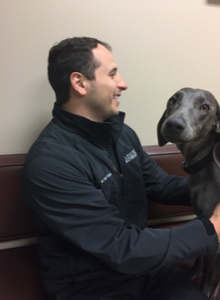 Sadie’s in-depth cardio evaluation showed she has Patent Ductus Arteriosis (PDA). Fortunately for Sadie, this is a condition that can be fixed with a 99-100% success rate. The surgery involves placing an occluder (ACDO) in the open duct between the aorta and the pulmonary artery. 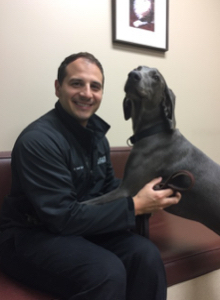 It is not without risks, but we have the utmost confidence in her cardiologist, Dr. Yanni Giatis, who will perform Sadie’s surgery next month. Sadie will have to stay overnight at the vet hospital for close monitoring, then she should be able to go home the following day. She will have to stay calm, relaxed, and inactive for at least 28 days as the heart heals around the occluder. Sadie’s bills were over $3,000. The surgery went well and she will lead a perfectly normal life.Thanks to her foster home, Lauren, outside of Indianapolis, for taking care of Sadie and keeping her safe before, during, and after her procedure. Sadie has been adopted and is doing wonderful in her new home! Thanks to your generous donations, we have been able to help these pups and many more. Thank you! 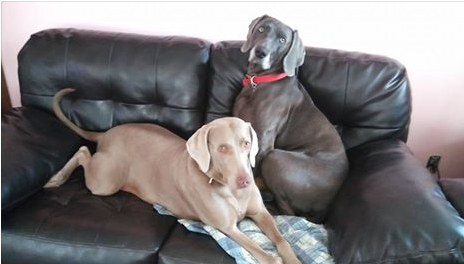 Please continue to support us and help us save more Weims!